Installing VersionPress is very similar to the process used for your other plugins, with the exception of the download location and manual uploading to the web server. To install the latest release of VersionPress you will need to first access the GitHub releases page and download the zip file. Afterwards you will have to access your WordPress’ administrators area, navigate to the Plugin section and click on the Add New button. You will be directed to the plugin showcase page. However, as you downloaded VersionPress, you will need to click on the Upload Plugin button. Now browse for the zip file on your local computer and then click on the Install Now button. Once the plugin has been unpackaged and installed, you will have to activate it. Click on the Activate Plugin button. In order to start tracking the changes on your website, you will need to once again activate the plugin. 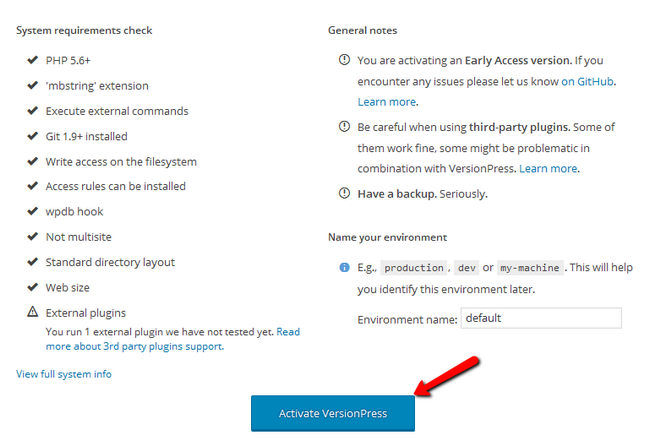 Click on the Continue here link right after the plugin has been installed or simply click on the newly created VersionPress section in the main admin navigation menu. On this page you will see the System Requirements and general notes about the plugin. As FastComet provides full compatibility with VersionPress, you should not be worried about the requirements being covered. Having an External plugin which has not yet been tested for compatibility with VersionPress will be shown below. Click on the big Activate VersionPress button to proceed. You have successfully installed VersionPress and can now monitor and revert the changes on your website.